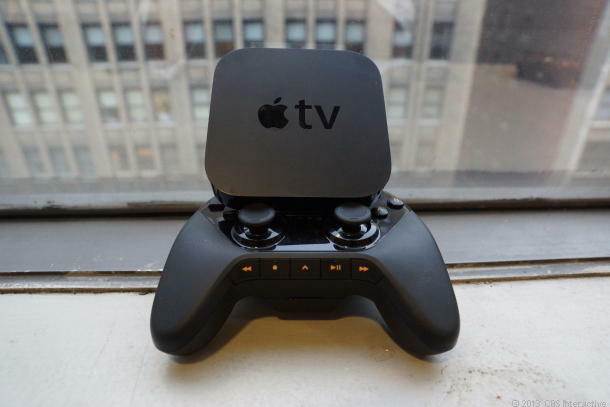 An Apple TV game console is a no-brainer ? Home » News Apple » An Apple TV game console is a no-brainer ? For almost as long as there’s been a rumor of a next-gen Apple TV, there’s been a rumor of an Apple game console. In a year where Apple’s product portfolio has been conservative — to be kind — it feels like new products, like the fabled iWatch, might be sliding off towards 2014. So what, if anything, could Apple surprise with? Of all the new products Apple could release this fall, a revamped Apple TV/game console would be the easiest to make… and could deliver a huge unexpected disruption to the upcoming next-gen game consoles from Sony and Microsoft. With a possible Amazon game console and maybe even a Google one rumored to be on the horizon, maybe it’s time Apple flexed its gaming muscle a little. I’m not talking about an actual TV with Apple hardware: I’m talking about a next-generation Apple TV box. Take the existing $99 black puck that’s already out there, add an upgraded A6 or A6X processor, and onboard storage, at least 16GB and hopefully higher. Maybe the hike up the price to $199. But here are five reasons why an Apple TV with gaming would be a great move for Apple right now. From big players like EA and Capcom to tiny one-person auteur operations, nobody in the entire gaming business has as diverse a portfolio of developer talent on a single platform as Apple. I’d think that would matter just a bit to developers once a gaming-ready Apple TV comes around. The potential for profit via the App Store has already been well-proven, especially over Android. Apple could even sweeten the deal by allowing Apple TV games to be cross-compatible on iPads and iPhones, expanding the installed platform to millions right off the bat. Imagine a universal version of Skyrim that could track progress and sync across an iPad, iPhone, or Apple TV for true play-anywhere gaming. iOS 7’s allowance for official stick-and-button game controllers is a big deal. At the very least, it means that iPhones, iPods, iPads and the Apple TV using AirPlay could gain controller support using existing hardware. Imagining the next Apple TV having direct game controller support without a mediating iPhone oriPad isn’t a stretch at all. The exising Apple TV remote is limited; a revamped remote with controller elements could make Apple TV feel a lot different. A lack of proper game control hampers port-over games on iOS. Fix that, and who knows what types of games could suddenly get made for the App Store. Imagine if EA suddenly debuted a full-blown version of Madden, or Activision showed a new Call of Duty. These games have existed in control-hobbled or dumbed-down forms on iOS, but better graphics and controller support could get iOS gaming to turn the corner from casual content to deeper, more advanced experiences. As graphics performance keeps improving, there’s no reason why this couldn’t happen. The Nintendo Wii caught fire, in part, because it was less expensive than the competition. A cheaper Apple TV game box could undercut the Xbox One and PS4. Sure, it would be a completely different experience altogether, but depending on what games it had a lot of families might prefer an Apple TV game system. Keep in mind: with the Wii U at $350, PS4 at $400, Xbox One at $500, and current PS3 and Xbox 360 systems around $300, an updated Apple TV at $199 or less would immediately be a go-to choice for price sensitive shoppers. AirPlay gaming on Apple TV — albeit in a limited capacity — is already possible via iPads, iPhones and iPods. Meanwhile, Sony, Microsoft and Nintendo are all exploring second screens via the Vita, tablets (Smart Glass) and the Wii U GamePad, respectively. Apple’s iOS device second-screen strategy could expand on a new game platform, enabling multi-player games and more elaborate experiences. The pieces are already in place. The PS4 and Xbox One have a lot of great entertainment features, but they’re game consoles first. The Apple TV has slowly but steadily added a number of video apps and services, plus it’s very good at serving up iTunes content and being a wireless hub for iPhones, iPads, iPod Touches and Macs. All we need now is for Apple to announce a new Apple TV this fall. And, I don’t think that’s so far-fetched at all.